The inaugural exhibition, Ando and Le Corbusier: Masters of Architecture, on view October 12–December 15, 2018, will explore French architect Le Corbusier’s important influence on Ando. Curbed Chicago covered the opening of the new space and their story includes several wonderful photographs by Esto Photography’s Jeff Goldberg. In a city filled with many internationally regarded art institutions, Wrightwood 659 aims for more “intimate experiences of art and architecture,” the venue said in a statement. Wrightwood won’t own a collection, but it plans to host exhibitions that focus on socially engaged art and explorations in architecture and design. As the summer winds down, I thought I’d share a few images from the work we’re doing on Jefferson Tower at 200 N. Jefferson in the Fulton River District. The project is a reminder of weather's cumulative impact on urban buildings. As the AIA shares on their website: "Designing and building resilient buildings is not a choice, it’s an imperative." As temperatures and weather become more extreme, regular building envelope evaluation, repair and preservation become key to maintaining that resiliance. Original construction of the high-rise condominium began in 2004 and was completed in 2006. After a dozen years of exposure to atmospheric carbon dioxide and Chicago’s climate – with its extreme temperatures and wind-driven rain, sleet and snow – the exterior today requires comprehensive repair and maintenance. While concrete is highly durable, it still has properties that make the development of cracks inevitable - even in the best weather conditions. The structure has 24 stories and 198 separate units. The scope of the Jefferson Tower project includes: concrete repairs, crack repairs, sealant replacement, exterior coating, and balcony waterproofing replacement. Watch my Twitter feed for project updates. Tomorrow is #EarthOvershootDay - a designation which marks the moment our demand for natural resources exceeds what the planet can renew. According to the Global Footprint Network (GFN), we reach that day this year on August 1 - the earliest it has ever been. "While our planet is finite, human possibilities are not. The transformation to a sustainable, carbon-neutral world will succeed if we apply humanity’s greatest strengths: foresight, innovation, and care for each other. The good news is that this transformation is not only technologically possible, it is also economically beneficial and our best chance for a prosperous future." Sustainability is a complex concept that is gaining importance in many sectors. The American Institute of Architects (AIA) actively promotes sustainability and empowers architects to design a world that allows people, communities, and our planet to thrive. They understand that a community's sustainability goals are fulfilled in large part by an architect’s ability to create practical solutions to the challenges posed by climate change, population growth and the pursuit of more connected, healthier communities. Earlier this year, they offered a progress report on their Sustainability Leadership Opportunity Scan project and their efforts to provide architects with the tools needed to meet the sustainability challenges of today. Let's use tomorrow to stimulate conversations about sustainability. 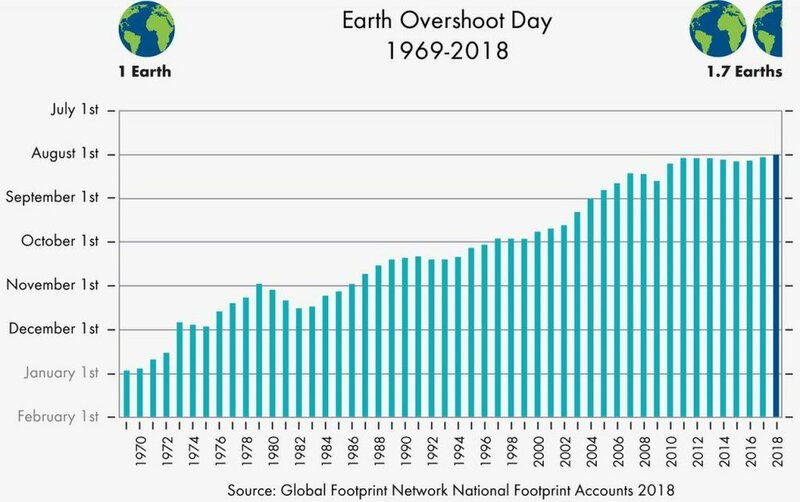 You can learn more about #EarthOvershootDay here.